This article is about the tower in Toronto. For the tower in Edmonton, see CN Tower (Edmonton). The CN Tower (French: Tour CN) is a 553.3 m-high (1,815.3 ft) concrete communications and observation tower located in Downtown Toronto, Ontario, Canada. Built on the former Railway Lands, it was completed in 1976. Its name "CN" originally referred to Canadian National, the railway company that built the tower. Following the railway's decision to divest non-core freight railway assets prior to the company's privatization in 1995, it transferred the tower to the Canada Lands Company, a federal Crown corporation responsible for real estate development. CN Tower is the world's 9th tallest free-standing structure. The CN Tower held the record for the world's tallest free-standing structure for 32 years until 2007 when it was surpassed by the Burj Khalifa and was the world's tallest tower until 2009 when it was surpassed by the Canton Tower. It is now the ninth tallest free-standing structure in the world and remains the tallest free-standing structure in the Western Hemisphere. In 1995, the CN Tower was declared one of the modern Seven Wonders of the World by the American Society of Civil Engineers. It also belongs to the World Federation of Great Towers. It is a signature icon of Toronto's skyline and attracts more than two million international visitors annually. The original concept of the CN Tower originated in 1968 when the Canadian National Railway wanted to build a large TV and radio communication platform to serve the Toronto area, as well as demonstrate the strength of Canadian industry and CN in particular. These plans evolved over the next few years, and the project became official in 1972. The tower would have been part of Metro Centre (see CityPlace), a large development south of Front Street on the Railway Lands, a large railway switching yard that was being made redundant by newer yards outside the city. Key project team members were NCK Engineering as structural engineer; John Andrews Architects; Webb, Zerafa, Menkes, Housden Architects; Foundation Building Construction; and Canron (Eastern Structural Division). As Toronto grew rapidly during the late 1960s and early 1970s, multiple skyscrapers were constructed in the downtown core, most notably First Canadian Place. The reflective nature of the new buildings compromised the quality of broadcast signals necessitating new, higher antennas that were at least 300 m (980 ft) tall. At the time, most data communications took place over point-to-point microwave links, whose dish antennae covered the roofs of large buildings. As each new skyscraper was added to the downtown, former line-of-sight links were no longer possible. CN intended to rent "hub" space for microwave links, visible from almost any building in the Toronto area. The CN Tower can be seen from at least as far away as Kennedy Street in Aurora, Ontario, approximately 40 km (25 mi) to the north. 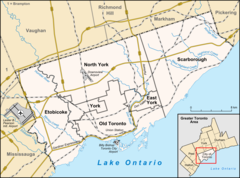 It is also viewable to the naked eye from 60 km (37 mi) east of Toronto in Oshawa, several points along the Niagara Escarpment west of Toronto in Hamilton, Ontario, and 48 km (30 mi) to the south from Fort Niagara State Park in the U.S. state of New York. The original plan for the tower envisioned a tripod consisting of three independent cylindrical "pillars" linked at various heights by structural bridges. Had it been built, this design would have been considerably shorter, with the metal antenna located roughly where the concrete section between the main level and the SkyPod lies today. As the design effort continued, it evolved into the current design with a single continuous hexagonal core to the SkyPod, with three support legs blended into the hexagon below the main level, forming a large Y-shape structure at the ground level. The idea for the main level in its current form evolved around this time, but the Space Deck (later renamed SkyPod) was not part of the plans until some time later. One engineer in particular felt that visitors would feel the higher observation deck would be worth paying extra for, and the costs in terms of construction were not prohibitive. It was also some time around this point that it was realized that the tower could become the world's tallest structure, and plans were changed to incorporate subtle modifications throughout the structure to this end. Construction on the CN Tower began on February 6, 1973, with massive excavations at the tower base for the foundation. By the time the foundation was complete, 56,000 t (61,729 short tons; 55,116 long tons) of earth and shale were removed to a depth of 15 m (49.2 ft) in the centre, and a base incorporating 7,000 m3 (9,156 cu yd) of concrete with 450 t (496 short tons; 443 long tons) of rebar and 36 t (40 short tons; 35 long tons) of steel cable had been built to a thickness of 6.7 m (22.0 ft). This portion of the construction was fairly rapid, with only four months needed between the start and the foundation being ready for construction on top. To create the main support pillar, workers constructed a hydraulically raised slipform at the base. This was a fairly unprecedented engineering feat on its own, consisting of a large metal platform that raised itself on jacks at about 6 m (19.7 ft) per day as the concrete below set. Concrete was poured continuously by a team of 1,532 people until February 22, 1974, during which it had already become the tallest structure in Canada, surpassing the recently built Inco Superstack in Sudbury, which was built using similar methods. In total, the tower contains 40,500 m3 (52,972 cu yd) of concrete, all of which was mixed on-site in order to ensure batch consistency. Through the pour, the vertical accuracy of the tower was maintained by comparing the slip form's location to massive plumb bobs hanging from it, observed by small telescopes from the ground. Over the height of the tower, it varies from true vertical accuracy by only 29 mm (1.1 in). In August 1974, construction of the main level commenced. Using 45 hydraulic jacks attached to cables strung from a temporary steel crown anchored to the top of the tower, twelve giant steel and wooden bracket forms were slowly raised, ultimately taking about a week to crawl up to their final position. These forms were used to create the brackets that support the main level, as well as a base for the construction of the main level itself. The Space Deck (currently named SkyPod) was built of concrete poured into a wooden frame attached to rebar at the lower level deck, and then reinforced with a large steel compression band around the outside. The antenna was originally to be raised by crane as well, but during construction the Sikorsky S-64 Skycrane helicopter became available when the United States Army sold one to civilian operators. 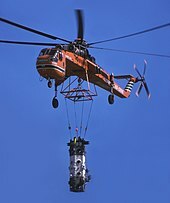 The helicopter, named "Olga", was first used to remove the crane, and then flew the antenna up in 36 sections. The flights of the antenna pieces were a minor tourist attraction of their own, and the schedule was printed in the local newspapers. 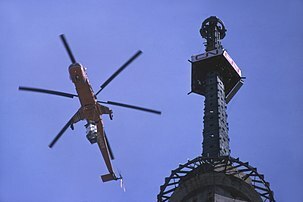 Use of the helicopter saved months of construction time, with this phase taking only three and a half weeks instead of the planned six months. The tower was topped-off on April 2, 1975, after 26 months of construction, officially capturing the height record from Moscow's Ostankino Tower, and bringing the total mass to 118,000 t (130,073 short tons; 116,136 long tons). Two years into the construction, plans for Metro Centre were scrapped, leaving the tower isolated on the Railway Lands in what was then a largely abandoned light-industrial space. This caused serious problems for tourists to access the tower. Ned Baldwin, project architect with John Andrews, wrote at the time that "All of the logic which dictated the design of the lower accommodation has been upset," and that "Under such ludicrous circumstances Canadian National would hardly have chosen this location to build." The CN Tower opened to the public on June 26, 1976. The construction costs of approximately CA$63 million ($270 million in 2018 dollars) were repaid in fifteen years. Canadian National Railway sold the tower prior to taking the company private in 1995, when it decided to divest all operations not directly related to its core freight shipping businesses. From the mid-1970s to the mid-1980s, the CN Tower was practically the only development along Front Street West; it was still possible to see Lake Ontario from the foot of the CN Tower due to the expansive parking lots and lack of development in the area at the time. As the area around the tower was developed, particularly with the completion of the Metro Toronto Convention Centre in 1984 and the SkyDome in 1989 (renamed Rogers Centre in 2005), the former Railway Lands were redeveloped and the tower became the centre of a newly developing entertainment area. Access was greatly improved with the construction of the SkyWalk in 1989, which connected the tower and SkyDome to the nearby Union Station railway and subway station, and, in turn, to the city's PATH underground pedestrian system. By the mid-1990s, it was the centre of a thriving tourist district. The entire area continues to be an area of intense building, notably a boom in condominium construction in the first two decades of the 21st century, as well as the 2013 opening of the Ripley's Aquarium by the base of the tower. Fireworks display on the CN Tower during the opening ceremony of the 2015 Pan American Games. While still under construction, the CN Tower officially became the world's tallest free-standing structure on March 31, 1975. 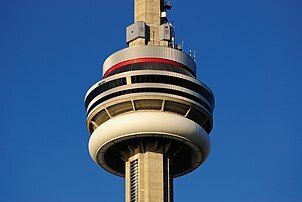 When the CN Tower opened in 1976, there were three public observation points: the SkyPod (then known as the Space Deck) that stands at 447 m (1,467 ft), the Indoor Observation Level (later named Indoor Lookout Level) at 346 m (1,135 ft), and the Outdoor Observation Terrace (at the same level as the Glass Floor) at 342 m (1,122 ft). One floor above the Indoor Observation Level was the Top of Toronto Restaurant, which completed a revolution once every 72 minutes. Stuntman Dar Robinson jumped off of the CN Tower on two occasions in 1979 and 1980. The first was for a scene from the movie Highpoint, in which Robinson received $250,000 for the stunt. The second was for a personal documentary. Both stunts used a wire decelerator attached to his back. On June 26, 1986, the ten-year anniversary of the tower's opening, high-rise firefighting and rescue advocate Dan Goodwin, in a sponsored publicity event, used his hands and feet to climb the outside of the tower, a feat he performed twice on the same day. Following both ascents, he used multiple rappels to descend to the ground. The Glass Floor, at an elevation of 342 m (1,122 ft), opened to the public on June 26, 1994. From 1997 to January 2004, TrizecHahn Corporation managed the tower and instituted several expansion projects including a C$26 million entertainment expansion and revitalization that included the 1997 addition of two new elevators (to a total of six) and the consequential relocation of the staircase from the north side leg to inside the core of the building, a conversion that also added nine stairs to the climb. TrizecHahn also owned the Willis Tower (Sears Tower at the time) in Chicago approximately at the same time. In 2007, light-emitting diode (LED) lights replaced the incandescent lights that lit the CN Tower at night, the reason cited that LED lights are more cost and energy efficient than the incandescent lights. The colour of the LED lights can change, compared to the constant white colour of the incandescent lights. On September 12, 2007, Burj Khalifa, then under construction and known as Burj Dubai, surpassed the CN Tower as the world's tallest free-standing structure. In 2008, glass panels were installed in one of the CN Tower elevators, which established a world record (346 m) for highest glass floor panelled elevator in the world. The CN Tower was closed during the G20 summit on June 26–27, 2010, for security reasons, given its proximity to the Metro Toronto Convention Centre. In 2011, EdgeWalk (where at an elevation of 356 metres (1,168 ft), visitors tethered to an overhead rail system can walk on the roof of the main pod) opened to the public. On July 10, 2015, the CN Tower was incorporated into the opening ceremony of the 2015 Pan American Games. A pre-recorded segment featured Bruny Surin passing the flame to Donovan Bailey on the EdgeWalk and parachuting into Rogers Centre. A fireworks display off the tower served as the ceremony's finale. On July 1, 2017, as part of the nationwide celebrations for Canada 150, fireworks were once again shot from the tower, in a five-minute display coordinated with the tower lights and music broadcast on a local radio station. The CN Tower consists of several substructures. The main portion of the tower is a hollow concrete hexagonal pillar containing the stairwells and power and plumbing connections. The Tower's six elevators are located in the three inverted angles created by the Tower's hexagonal shape (two elevators per angle). Each of the three elevator shafts is lined with glass, allowing for views of the city as the glass-windowed elevators make their way through the Tower. The stairwell was originally located in one of these angles (the one facing north), but was moved into the central hollow of the Tower; the Tower's new fifth and sixth elevators were placed in the hexagonal angle that once contained the stairwell. On top of the main concrete portion of the Tower is a 102-metre (334.6 ft) tall metal broadcast antenna, carrying TV and radio signals. There are three visitor areas: the Glass Floor and Outdoor Observation Terrace, which are both located at an elevation of 342 metres (1,122 ft), the Indoor Lookout Level (formerly known as "Indoor Observation Level") located at 346 metres (1,135 ft), and the higher SkyPod (formerly known as "Space Deck") at 446.5 metres (1,465 ft), just below the metal antenna. The hexagonal shape can be seen between the two areas; however, below the main deck, three large supporting legs give the tower the appearance of a large tripod. The main deck level is seven storeys, some of which are open to the public. Below the public areas — at 338 m (1,108.9 ft) — is a large white donut-shaped radome containing the structure's microwave receivers. The glass floor and outdoor observation deck are at 342 metres (1,122.0 ft). The glass floor has an area of 24 m2 (258 sq ft) and can withstand a pressure of 4,100 kilopascals (595 psi). The floor's thermal glass units are 64 mm (2.5 in) thick, consisting of a pane of 25-millimetre (1.0 in) laminated glass, 25 mm (1.0 in) airspace and a pane of 13 mm (0.5 in) laminated glass. 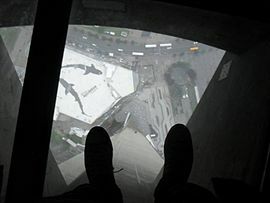 Some people experience acrophobia when standing on the glass floor and looking down at the ground 342 m (1,122.0 ft) below. In 2008, one elevator was upgraded to add a glass floor panel, believed to have the highest vertical rise of any elevator equipped with this feature. The Horizons Cafe and the lookout level are at 346 metres (1,135.2 ft). The 360 Restaurant, a revolving restaurant that completes a full rotation once every 72 minutes, is at 351 m (1,151.6 ft). When the tower first opened, it also featured a disco named Sparkles (at the Indoor Observation Level), billed as the highest disco and dance floor in the world. The SkyPod was once the highest public observation deck in the world until it was surpassed by the Shanghai World Financial Center in 2008. A metal staircase reaches the main deck level after 1,776 steps, and the SkyPod 100 m (328 ft) above after 2,579 steps; it is the tallest metal staircase on Earth. These stairs are intended for emergency use only and are not open to the public, except for twice per year for charity stair-climb events. The average climber takes approximately 30 minutes to climb to the base of the radome, but the fastest climb on record is 7 minutes and 52 seconds in 1989 by Brendan Keenoy, an Ontario Provincial Police officer. In 2002, Canadian Olympian and Paralympic champion Jeff Adams climbed the stairs of the tower in a specially designed wheelchair. The stairs were originally on one of the three sides of the tower (facing north), with a glass view, but these were later replaced with the third elevator pair and the stairs were moved to the inside of the core. Top climbs on the new, windowless stairwell used since around 2003 have generally been over ten minutes. On August 1, 2011, the CN Tower opened the EdgeWalk, an amusement in which thrill-seekers can walk on and around the roof of the main pod of the tower at 356 m (1,168.0 ft), which is directly above the 360 Restaurant. It is the world's highest full-circle, hands-free walk. Visitors are tethered to an overhead rail system and walk around the edge of the CN Tower's main pod above the 360 Restaurant on a 1.5 m (4.9 ft) metal floor. The attraction is closed throughout the winter and during periods of electrical storms and high winds. One of the notable guests who visited EdgeWalk includes Canadian comedian Rick Mercer, as featured on his CBC Television news satire show, Rick Mercer Report. There, he was accompanied by Canadian pop singer Jann Arden. The episode aired on April 2013. A freezing rain storm on March 2, 2007, resulted in a layer of ice several centimetres thick forming on the side of the tower and other downtown buildings. The sun thawed the ice, and winds of up to 90 km/h (56 mph) blew some of it away from the structure. There were fears that cars and windows of nearby buildings would be smashed by large chunks of ice. In response, police closed some streets surrounding the tower. During morning rush hour on March 5 of the same year, police expanded the area of closed streets to include the Gardiner Expressway 310 metres (1,017 ft) away from the tower as increased winds blew the ice farther away, as far north as King Street West, 490 m (1,608 ft) away, where a taxicab window was shattered. Subsequently, on March 6, 2007, the Gardiner Expressway reopened after winds abated. 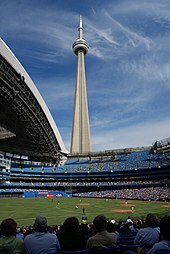 On April 16, 2018, falling ice from the CN Tower punctured the roof of the nearby Rogers Centre, causing the Toronto Blue Jays to postpone the game that day to the following day as a doubleheader; this was the third doubleheader held at the Rogers Centre. On April 20, the CN Tower reopened. In August 2000, a fire broke out at the Ostankino Tower in Moscow killing three people and causing extensive damage. The fire was blamed on poor maintenance and outdated equipment. The failure of the fire-suppression systems and the lack of proper equipment for firefighters allowed the fire to destroy most of the interior and spark fears the tower might even collapse. an elevator that can be used during a fire as it runs up the outside of the building and can be powered by three emergency generators at the base of the structure (unlike the elevator at the Ostankino Tower, which malfunctioned). Officials also noted that the CN Tower has an excellent safety record, although there was an electrical fire in the antennae on August 16, 2017 — the tower's first fire. Moreover, other supertall structures built between 1967 and 1976 — such as the Willis Tower (formerly the Sears Tower), the World Trade Center (until its destruction on September 11, 2001), the Fernsehturm Berlin, the Aon Center, 875 North Michigan Avenue (formerly the John Hancock Center), and First Canadian Place — also have excellent safety records, which suggests that the Ostankino Tower accident was a rare safety failure, and that the likelihood of similar events occurring at other supertall structures is extremely low. Panoramic view from the CN Tower. The Toronto Islands and the island airport on Lake Ontario are visible on the left side of the image while buildings of Toronto's Financial District are visible on the right. The CN Tower was originally lit at night with incandescent lights, which were removed in 1997, because they were inefficient and expensive to repair. In June 2007, the tower was outfitted with 1,330 super-bright LED lights inside the elevator shafts, shooting over the main pod and upward to the top of the tower's mast to light the tower from dusk until 2 a.m. The official opening ceremony took place on June 28 before the Canada Day holiday weekend. The tower changes its lighting scheme on holidays and to commemorate major events. After the 95th Grey Cup in Toronto, the tower was lit in green and white to represent the colours of the Grey Cup champion Saskatchewan Roughriders. From sundown on August 27, 2011, to sunrise the following day, the tower was lit in orange, the official colour of the New Democratic Party (NDP), to commemorate the death of federal NDP leader and leader of the official opposition Jack Layton. When former South African president Nelson Mandela died, the tower was lit in the colours of the South African flag. When former federal finance minister under Stephen Harper's Conservatives Jim Flaherty died, the tower was lit in green to reflect his Irish Canadian heritage. On the night of the attacks on Paris on November 13, 2015, the tower displayed the colours of the French flag. Programmed from a desktop computer with a wireless network interface controller in Burlington, Ontario, the LEDs use less energy to light than the previous incandescent lights (10% less energy than the dimly lit version and 60% less than the brightly lit version). The estimated cost to use the LEDs is $1,000 per month. During the spring and autumn bird migration seasons, the lights would be turned off to comply with the voluntary Fatal Light Awareness Program, which "encourages buildings to dim unnecessary exterior lighting to mitigate bird mortality during spring and summer migration." CN Tower as seen from its base. The CN Tower is the tallest freestanding structure in the Western Hemisphere. As of 2013, there are only two other freestanding structures in the Western Hemisphere which exceed 500 m (1,640.4 ft) in height; the Willis Tower in Chicago, which stands at 527 m (1,729.0 ft) when measured to its pinnacle; and the topped-out One World Trade Center in New York City, which has a pinnacle height of 541.33 m (1,776.0 ft), or approximately 12 m (39.4 ft) shorter than the CN Tower. Due to the symbolism of the number 1776 (the year of the signing of the United States Declaration of Independence), the height of One World Trade Center is unlikely to be increased. The proposed Chicago Spire was expected to exceed the height of the CN Tower, but its construction was halted early due to financial difficulties amid the Great Recession, and was eventually cancelled in 2010. Guinness World Records has called the CN Tower "the world's tallest self-supporting tower" and "the world's tallest free-standing tower". Although Guinness did list this description of the CN Tower under the heading "tallest building" at least once, it has also listed it under "tallest tower", omitting it from its list of "tallest buildings." In 1996, Guinness changed the tower's classification to "World's Tallest Building and Freestanding Structure". Emporis and the Council on Tall Buildings and Urban Habitat both listed the CN Tower as the world's tallest free-standing structure on land, and specifically state that the CN Tower is not a true building, thereby awarding the title of world's tallest building to Taipei 101, which is 44 metres (144 ft) shorter than the CN Tower. The issue of what was tallest became moot when Burj Khalifa, then under construction, exceeded the height of the CN Tower in 2007 (see below). Although the CN Tower contains a restaurant, a gift shop and multiple observation levels, it does not have floors continuously from the ground, and therefore it is not considered a building by the Council on Tall Buildings and Urban Habitat (CTBUH) or Emporis. CTBUH defines a building as "a structure that is designed for residential, business, or manufacturing purposes. An essential characteristic of a building is that it has floors." The CN Tower and other similar structures—such as the Ostankino Tower in Moscow, Russia; the Oriental Pearl Tower in Shanghai, China; the Stratosphere Tower in Las Vegas, Nevada, USA; and the Eiffel Tower in Paris, France—are categorized as "towers", which are free-standing structures that may have observation decks and a few other habitable levels, but do not have floors from the ground up. The CN Tower was the tallest tower by this definition until 2010 (see below). Taller than the CN Tower are numerous radio masts and towers, which are held in place by guy-wires, the tallest being the KVLY-TV mast in Blanchard, North Dakota, USA at 628 metres (2,060 ft) tall, leading to a distinction between these and "free-standing" structures. Additionally, the Petronius Platform stands 610 metres (2,001 ft) above its base on the bottom of the Gulf of Mexico, but only the top 75 metres (246 ft) of this oil and natural gas platform are above water, and the structure is thus partially supported by its buoyancy. Like the CN Tower, none of these taller structures are commonly considered buildings. On September 12, 2007, Burj Khalifa, which is a hotel, residential and commercial building in Dubai, United Arab Emirates, and was formerly known as Burj Dubai before opening, passed the CN Tower's 553.33-metre height. The CN Tower held the record of tallest free-standing structure on land for over 30 years. After Burj Khalifa had been formally recognized by the Guinness World Records as the world's tallest freestanding structure, Guinness re-certified CN Tower as the world's tallest freestanding tower. The tower definition used by Guinness was defined by the Council on Tall Buildings and Urban Habitat as 'a building in which less than 50% of the construction is usable floor space'. Guinness World Records editor-in-chief Craig Glenday announced that Burj Khalifa was not classified as a tower because it has too much usable floor space to be considered to be a tower. CN Tower still held world records for highest above ground wine cellar (in 360 Restaurant) at 351 metres, highest above ground restaurant at 346 metres (Horizons Restaurant), and tallest free-standing concrete tower during Guinness's recertification. The CN Tower was surpassed in 2009 by the Canton Tower in Guangzhou, China, which stands at 604 metres (1,982 ft) tall, as the world's tallest tower; which in turn was surpassed by the Tokyo Skytree in 2011, which currently is the tallest tower at 634.0 metres (2,080.1 ft) in height. 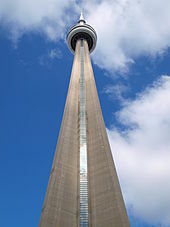 The CN Tower, as of 2018, stands as the ninth-tallest free-standing structure on land, remains the tallest free-standing structure in the Western Hemisphere, and is the third-tallest tower. 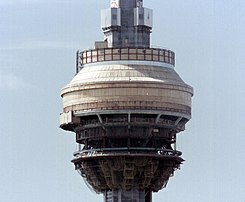 The CN Tower has been and continues to be used as a communications tower for a number of different media and by numerous companies. There is no AM broadcasting on the CN Tower. The FM antennas are situated 421 metres (1,381 ft) above ground. The CN Tower has been featured in numerous films, television shows, and video games, as well as having its own official mascot, which resembles the tower itself. Highpoint is a Canadian 1982 action film starring Richard Harris, Christopher Plummer and Beverly D'Angelo. It features a shot of stuntman Dar Robinson jumping off of the CN Tower in 1979. Views is a 2016 studio album released on April 29, 2016 by Canadian rapper Drake. The cover artwork features Drake sitting atop the CN Tower in Toronto. Drake appeared significantly larger than life-size on the cover, and CN Tower's Twitter account later confirmed it to be photo edited. Wikimedia Commons has media related to CN Tower. ^ a b "Compare Data: Results". The Skyscraper Center. 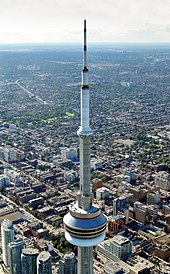 ^ "CN Tower retains world record as tallest 'tower'". Toronto Star. September 22, 2009. ^ a b c "The Tower, according to Guinness World Records". CN Tower. ^ "CN Tower no longer world's tallest". Toronto Star. September 13, 2007. ^ a b c d "CN Tower". SkyscraperPage. ^ a b c d e f g h i "Facts and visitor information on the CN Tower in Canada". The World Federation of Great Towers. Retrieved January 2, 2013. ^ a b c d e f g h "Canada's Wonder of the World". CN Tower. Archived from the original on July 23, 2007. Retrieved September 26, 2007. ^ "The world's tallest structures through history". The Daily Telegraph. London. April 20, 2017. ^ "Modern World Wonders-CN Tower". www.theworldwonders.com. ^ Mollins, Julie (April 9, 2008). "CN Tower's glass-floored lift not for faint-hearted". Reuters. ^ a b "Canton Tower, Guangzhou". SkyscraperPage. ^ Rosenberg, Matt (March 3, 2017). "Seven Wonders of the World". ThoughtCo. Retrieved August 30, 2017. ^ a b c "The Seven Wonders of the Modern World". Infoplease.com. Retrieved January 2, 2013. ^ Plummer, Kevin (September 4, 2007). "The CN Tower is Dead. Long Live The CN Tower!". The Torontoist. Retrieved November 17, 2008. ^ "World Wonders and Facts at a Glance" (PDF). CN Tower. Retrieved August 30, 2017. ^ a b c d e f g h i TrizecHahn. "A Brief Overview of the CN Tower". Institute of Electrical and Electronics Engineers. Retrieved January 2, 2013. ^ Fulford, Robert (March 13, 1996). Accidental city: the transformation of Toronto. MacFarlane, Walter & Ross. p. 32. ISBN 978-0395773079. ^ Botelho-Urbanski, Jessica (June 25, 2016). "CN Tower celebrates 40 years as a tourist magnet and lightning rod". Toronto Star. Retrieved June 27, 2016. ^ Canadian inflation numbers based on Statistics Canada tables 18-10-0005-01 (formerly CANSIM 326-0021) "Consumer Price Index, annual average, not seasonally adjusted". Statistics Canada. Retrieved March 6, 2019. and 18-10-0004-13 "Consumer Price Index by product group, monthly, percentage change, not seasonally adjusted, Canada, provinces, Whitehorse, Yellowknife and Iqaluit". Statistics Canada. Retrieved March 6, 2019. ^ "General Information" (PDF). CN Tower. 2013. ^ a b Kupferman, Steve (February 26, 2010). "Man Jumps From CN Tower With No Parachute (Thirty Years Ago)". Torontoist. ^ Goodwin, Dan. "Dan Goodwin's Building Climbs". Skyscraperdefense.com. Retrieved January 2, 2013. ^ a b "CN Tower dethroned by Dubai building". CBC News. September 12, 2007. Archived from the original on November 18, 2010. Retrieved April 9, 2008. ^ "CN Tower". SkyscraperPage.com. Skyscraper Source Media. Archived from the original on April 6, 2008. Retrieved April 9, 2008. ^ Canadian Press (April 9, 2008). "CN Tower's glass-floor elevator aims for record". Toronto Star. Archived from the original on November 18, 2010. Retrieved April 9, 2008. Both linked pages include a video of the elevator with glass floor in operation. ^ Malcolm, Andrew. "A New High for Disco in Toronto's Tower", The New York Times, October 10, 1979. Accessed February 10, 2011. ^ "Shanghai World Financial Center". Emporis.com. Archived from the original on March 16, 2008. Retrieved May 22, 2008. ^ a b "Man climbs CN Tower steps in wheelchair". CBC News. Canadian Broadcasting Corporation. September 27, 2002. Archived from the original on November 18, 2010. Retrieved January 4, 2008. ^ a b "18th Annual Canada Life CN Tower Climb for WWF Canada". World Wide Fund for Nature (WWF) Canada. Archived from the original on March 24, 2008. Retrieved March 20, 2008. ^ a b Ferenc, Leslie (October 15, 2007). "Corporate climbers ready to step up for charity". Toronto Star. Archived from the original on November 18, 2010. Retrieved March 20, 2008. ^ "21st Annual Canada Life CN Tower Climb for WWF-Canada". WWF. Retrieved January 2, 2013. 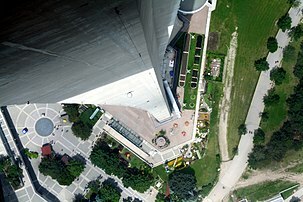 ^ "New CN Tower attraction offers a walk on the outside". Toronto Star. May 9, 2011. Retrieved January 3, 2013. ^ "Toronto's Most Extreme Attraction". CN Tower. Retrieved February 25, 2012. It is the world's highest full circle hands-free walk on a 5 ft (1.5 metres) wide ledge encircling the top of the Tower's main pod, 356m/1168ft (116 storeys) above the ground. ^ "Season 9 - Episode 1". Rick Mercer Report. CBC Television. April 10, 2013. ^ "Video: Falling CN Tower Ice". CITY-DT. March 2, 2007. Archived from the original on November 18, 2010. Retrieved June 26, 2007. ^ "CN Tower, closed since Monday due to falling ice concerns, reopens". cbc.ca. April 20, 2018. ^ Womackin, Helen (August 29, 2000). "Fire in 1,800ft TV tower adds to Russians' feeling of doom". The Independent. ^ a b "What if the CN Tower Caught Fire?". CBC News. Canadian Broadcasting Corporation. November 10, 2000. Archived from the original on November 18, 2010. Retrieved June 26, 2007. ^ Doherty, Brennan (August 16, 2017). "Fire crews tackle smouldering fire at CN Tower antenna". Toronto Star. The Canadian Press. ^ McLaughlin, Amara (August 16, 2017). "Fire inside broadcasting antenna atop CN Tower now extinguished". CBC News. Retrieved August 17, 2017. ^ Wilson, Codi (August 16, 2017). "CN Tower open for business after early morning fire in antenna mast". CTV Toronto News. Retrieved August 17, 2017. ^ "Jack Layton's 'passion, civility' honoured at funeral". CBC News. August 27, 2011. Retrieved August 28, 2011. ^ Black, Debra (May 30, 2007). "Come Canada Day, CN Tower will once again light up the night". Toronto Star. Retrieved July 17, 2011. ^ "CN Tower in Toronto receives LED lighting treatment". LEDs Magazine. June 18, 2007. Retrieved July 17, 2011. ^ "Calatrava Dances onto a New Stage". Bloomberg Businessweek. Archived from the original on February 13, 2011. ^ a b McWhirter, Norris (1981). Guinness Book of World Records 1982. New York: Sterling Publishing Co., Inc. p. 704. ISBN 978-0-8069-0225-8. OCLC 7902975. Reference is on page 275. ^ a b "Guinness Book of World Records 2005 – Science and Technology << Buildings". Archived from the original on August 26, 2011. Retrieved 2010-01-05. ^ a b "CTBUH Tall Building Database". Council on Tall Buildings and Urban Habitat. Archived from the original on November 18, 2010. Retrieved April 10, 2008. ^ Daubs, Katie (September 22, 2009). "CN tower now the 'world's tallest freestanding tower'". Toronto Star. Archived from the original on November 18, 2010. Retrieved September 22, 2009. ^ "CN Tower still world's tallest: Guinness". CBC News. September 18, 2009. ^ Owen, James (November 29, 2011). "World's Tallest Tower Rises in Tokyo". National Geographic News. ^ "Where Is The Largest Tower In The World?". worldatlas.com. October 4, 2018. ^ "AM Query & AM List Results". Federal Communications Commission – Audio Division. April 9, 2008. Archived from the original on November 18, 2010. Retrieved April 9, 2008. ^ "FM Query & FM List Results". Federal Communications Commission – Audio Division. April 9, 2008. Archived from the original on November 18, 2010. Retrieved April 9, 2008. ^ "Toronto ARES Channels". October 26, 2005. Retrieved August 3, 2006. ^ Fearon, Emily (July 19, 2017). "A new mascot for the CN Tower is a mini CN Tower". Toronto Star. ^ "Drake's towering view of The 6 | Toronto Star". thestar. Archived from the original on August 16, 2016. Retrieved July 11, 2016. ^ @TourCNTower (April 28, 2016). "CN Tower/La Tour CN on Twitter" (Tweet). Archived from the original on April 28, 2016 – via Twitter.